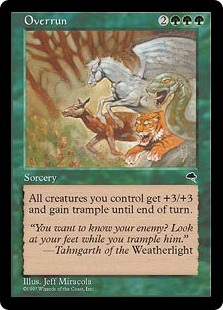 With Standard on the upswing recently, I’ve found myself making time for the Standard Showdown. I still play more Limited than anything else, but the Showdown is a great way to spend a relaxing weekend afternoon playing against a wide variety of decks. You can read more about the Standard Showdown via the official page. A few weeks ago, the Showdown at my LGS was delayed by half an hour, so I introduced myself to a player I had never seen at the store before. After chatting for a bit, we started a game of Commander to kill the time. My opponent was playing an aggressive Kaalia of the Vast deck, while I decided to try out my elf-tribal Rishkar, Peema Renegade just for kicks. I would consider this an uneven matchup at best, but due to some fortunate recursion of Beast Within and well-timed Overrun effects, I was able to keep my opponent at bay. Around turn 6 or 7, I had my opponent down to 3 life with no cards in hand, at which point they could only be saved by drawing a Wrath effect. It wasn’t looking good for them. I had an army of elves, each of which represented lethal damage on its own if I got another chance to attack. But as I passed the turn, I looked up to see my opponent sloppily grab two cards off the top of their deck. They passed the first card to their left hand, awkwardly—and surprisingly slowly—sliding it against their body, below the table. 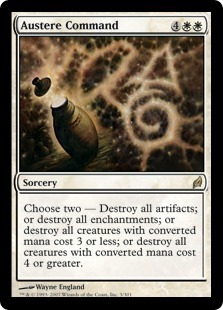 “This will do!” they exclaimed, casting the second card, an Austere Command. Dumbfounded to see my opponent so brazenly and obviously cheat against someone they just met in a casual game of Commander, I scooped up my cards. “Well, I saw you draw the second card, so I think I’m just done here…” I said, packing away my deck. “Yeah… you got that game,” they replied after a pause, clearly embarrassed, as they sheepishly packed up and moved to the other side of the store. As the Standard Showdown started, my only hope was that I didn’t have to sit through the awkwardness of playing against them again. Unfortunately, not only did I play them in the third round, but I had to experience calling them out for cheating again. And all of this after needing to explain multiple times the order in which spells resolve on the stack. It was at this point, completely bewildered, that I grabbed my things and removed myself from the situation, rather than argue with an opponent who had demonstrated reprehensible intentions on multiple occasions. It was clear that my opponent cared more about the feeling of having won a game than actually learning how to win, or even how to properly sequence fundamental mechanical interactions. Why not cheat at Magic: the Gathering? I left the Standard Showdown with a lot of questions. This was the first time I had caught an opponent cheating in a sanctioned event. Everyone can remember kitchen table games where they found a friend being dishonest; or maybe you can think back to times you fell for the temptation. Why cheat at Magic: the Gathering? Why not cheat, for that matter? After all, a win is a win, right? And who cares if nobody finds out? I’ve given this a lot of thought over the weekend, and here are five reasons I think cheating is, without exception, against your best interests as a player. 5. It’s dishonest and morally objectionable. 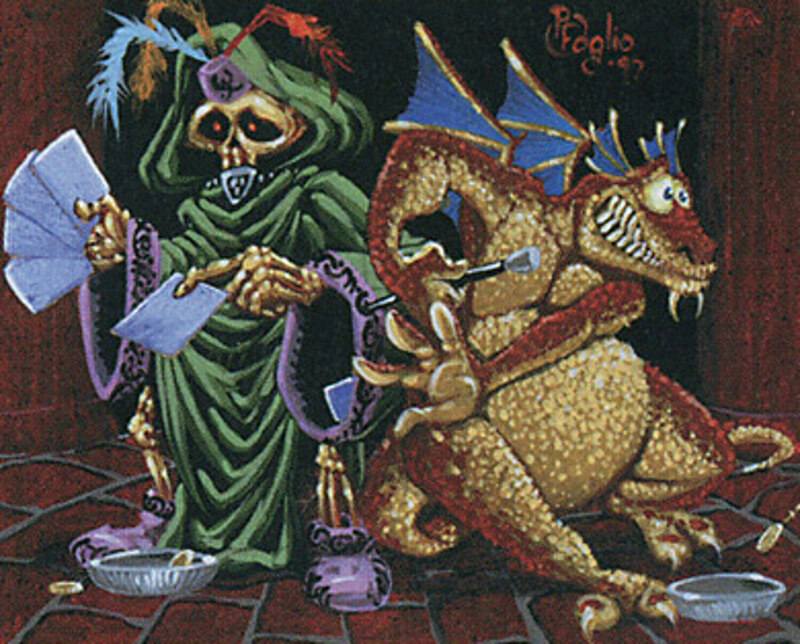 The first, most obvious reason you should not cheat at Magic—or other games for that matter—is that it is dishonest at best and morally objectionable at worst. When you cheat, you know it’s not right. And if you find yourself thinking that it’s justifiable for some reason, perhaps your time would be better spent somewhere else. I won’t dwell on this point, since I think it is already apparent to the vast majority of players, but I felt it should at least be mentioned. 4. You will get caught, eventually. No matter how deft or inept you are at cheating, you can almost certainly count on being caught. Like my opponent mentioned above, habitual or occasional cheating will eventually be discovered, and you will need to face that sinking feeling of regret. It casts a shadow over further play, and your opponents will remember. 3. Think you weren’t caught? Think again. Maybe you think you’ve gotten away with cheating in the past. Maybe you’ve even convinced yourself that it’s not “cheating.” The human brain is good at normalizing habituated behavior. Our ancestors slowly gained countless pattern recognition features, many of which work against us now if left unchecked. So maybe picking up that second card is no big deal, knowing that it gives you an edge, and no one will know. I would argue, however, that friends and opponents at your LGS have noticed; they just haven’t said anything, yet. Cheating puts your opponent in the awkward position of having to choose between confrontation or taking the abuse. People are generally averse to confrontation. Or they don’t care enough about you and the game enough to cause a stir. Or maybe they’re nervous at being placed unwillingly into a situation where they must argue against someone they already see as dishonest. For a lot of players—particularly those who find difficulty in stressful social situations—it just isn’t worth it to say something. 2. There can be lasting consequences in both sanctioned and casual play. What happens if you are caught? As a game played at a number of different Rules Enforcement Levels (REL), some with significant stakes, there are official policies that guide judges in these matters. The Magic™ Infraction Procedure Guide outlines official penalties and guiding philosophy behind said penalties, specifically for Competitive and Professional REL events. Wizards of the Coast’s stated official stance is that, “Rules violations usually require a penalty or they are unenforceable.” Similar, less severe guidance exists for Regular REL events like FNM. This comes with the caveat that the player cheating is both attempting to gain an advantage from the situation, and is reasonably aware that their actions were illegal. 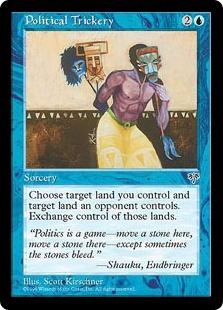 Examples include actions like: adding cards to a Sealed pool; allowing an opponent to incorrectly resolve or ignore state-based effects or portions of spells when it may be advantageous to stay quiet; drawing an extra card (even on accident) and then lying or failing to act as to avoid penalty. The list goes on, but the general gist is that the offending player in some way intentionally gains an advantage they did not earn through legal play. The penalty for cheating is disqualification. So what if your action does not meet all of the criteria for Unsporting Conduct – Cheating? According to the Infraction Procedure Guide, you likely qualify for other violations, which require penalties including warning, game loss, or disqualification. Even if you are not given a specific penalty for cheating, warnings and other infractions are kept on record to establish potential patterns. In the future, your infraction history could work against in an investigation by a judge. Maybe you don’t play in anything beyond Regular REL events like FNM or the Standard Showdown. 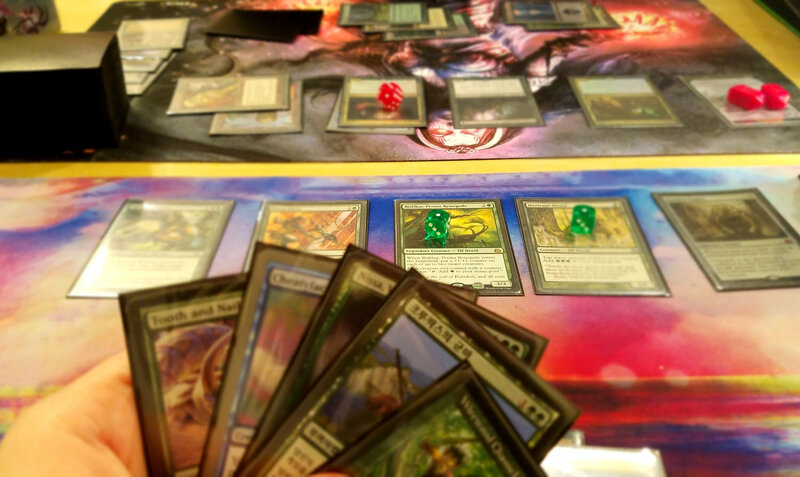 If you’re cheating at Magic: the Gathering, there’s a good chance that’s the case. 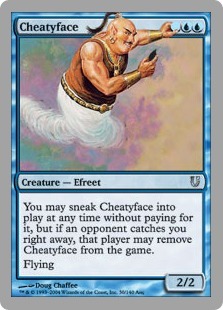 Whether it be at the kitchen table or your LGS, people will remember that you as a cheater. Magic in this capacity is more about having fun, and violating the trust of your friends and opponents is an easy way to end that fun. 1. It makes you worse at Magic. Finally, I want to touch on what I see as perhaps the most important reason you should care enough not to cheat: it makes you worse at playing the game. Or at the very least, it hinders your ability to improve. Cheating means you are forced to make decisions that did not come up naturally in the course of the game. You are no longer playing to your outs based on an opponent’s actions, but rather an altered game state that does not reflect a real game of Magic. When you’re in a dire spot and topdeck another Island, you are given an opportunity to discover something. 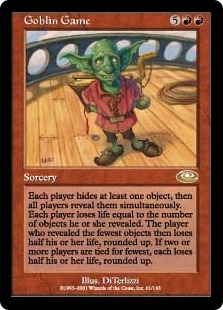 In my opinion, Magic is successful because it offers a huge variety of possibilities from a discrete set of rules. Each game has the chance to be different in numerous little ways, even if an overall matchup might look familiar. Cheating cuts you off from learning about a new interaction or situation. In the end, your relationship to the game and other players is up to you. Maybe you don’t care about cheating others. Maybe you don’t mind doing whatever it takes to win a game in the moment. I argue that cheating only robs you of more wins down the line, and it damages the integrity of a game we all love. Back at Grand Prix Indianapolis, I competed in a last chance Standard trial in an effort to win two byes for the main event. After the first match, I realized that the sideboard listed on my decklist was missing a card. Had I remained silent and continued the event with my full sideboard, I would have been knowingly cheating. Embarrassed, I apologized to my opponent and called a judge. The judge informed me that I could make my deck and sideboard match the list, and he would do the paperwork for a warning. I hated that feeling of taking what is an admittedly minor punishment, but I’m glad I went through that experience. Like what you see? Consider liking on Facebook or following on Twitter. Thanks for reading!